Defending champion Serena Williams loses 6-2, 6-2 in Round 2, follows sister Venus out of French Open. 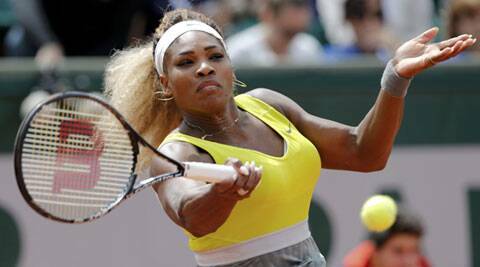 Holder and world No.1 Serena Williams suffered a crushing 6-2 6-2 defeat by Spain’s Garbine Muguruza in the French Open second round on Wednesday to follow her elder sister Venus out of the second grand slam of the year. Serena never looked the force that has won 17 major titles on a chilly day in Paris. Her 20-year-old opponent broke the American’s serve twice early in the first set and made the most of a series of unforced errors by Williams. The Spaniard, ranked 35 in the world, kept up the pressure and the match turned out to be a repeat of the nightmare of 2012, when Williams lost in the first round, not of the glory of 2013. A netted return from Williams sent the Spaniard into ecstasy and even Williams’s mother, Oracene, smiled as Muguruza leapt about the court. “Of course, it’s amazing,” Muguruza said. “I had to be really aggressive and focused. “Today is a great day. I’m so happy,” she shouted. Novak Djokovic, the men’s second seed from Serbia, had few problems in despatching Jeremy Chardy of France 6-1 6-4 6-2. The Williams sisters had been due to meet in the third round but Venus became the first seed to lose in the second round, falling 2-6 6-3 6-4 to Anna Schmiedlova of Slovakia. The 29th seed, wearing long sleeves to stay warm in temperatures of 14 Celsius, has never won the claycourt grand slam in 16 visits and the former world No.1, now 32, may have to accept she never will. Schmiedlova, aged 19 and ranked 56 in the world, wasted two match points on Williams’s serve before the American hit wide to set up a third, and the Slovak won the match with a fine backhand cross court shot. “This is the biggest win of my life,” said Schmiedlova, who broke down when expressing how much Venus had meant to her when she was growing up. Venus had got off a solid start, winning four games in a row against Schmiedlova to take the opening set. Her opponent, however, stepped up a gear and, after an early exchange of breaks, stole the nine-times grand slam champion’s serve in the seventh game of the second set and levelled the contest when her opponent netted a forehand. Schmiedlova pulled through thanks to a series of fine passing shots. Eugenie Bouchard, the 18th seed, recovered from a slow start to beat Julia Goerges of Germany in three sets. On the men’s side, Russian Mikhail Youzhny, seeded 15th, lost 6-0 6-3 3-6 6-4 to Czech Radek Stepanek before Spain’s Marcel Granollers overturned a two-set deficit to beat 20th seed Alexandr Dologopolov of Ukraine 1-6 3-6 6-3 6-0 6-2. Gilles Simon, the 29th seed, eased past Alejandro Gonzales of Colombia 6-4 6-0 6-2 and there were also straight-set wins for Spain’s Roberto Bautista Agut, the 27th seed, and Ernests Gulbis, the 18th seed from Latvia. Roger Federer was kept on his toes before he eventually subdued Argentine journeyman Diego Sebastian Schwartzman 6-3 6-4 6-4 to reach the third round of the French Open Wednesday. The 17-time grand slam champion from Switzerland, was kept under pressure throughout by the world No. 109, who never gave up and even broke serve in the first set. “I’ve always felt he had a little bit of an upper hand from the baseline. I feel he was doing a really good job being aggressive and making good plays,” Federer, who next faces Russian Dmitry Tursunov, said. “I wish I could have played a bit more freely today overall. But then again, I think it was a solid match. Federer admitted he had never seen his opponent before stepping on to court Suzanne Lenglen, but it will be another story against Tursunov. He has a 4-0 record against the Russian but the two have never played on clay. Their last meeting was in the third round at Indian Wells, with Federer needing two tiebreaks to go through. “I think before the match you have to think you’re going to play as if it was a hard court,” he said. “You have to slide, if you can, you have to run after the points. But I don’t know which points he’s going to focus on. Is it semi-volleys? It’s difficult on clay sometimes the way the balls bounce. Round 2 results: Men’s singles: Tomas Berdych (6) def. Aleksandr Nedovyesov 6-7(4) 6-4 7-5 6-3; Roger Federer (4) def. Diego Schwartzman 6-3 6-4 6-4; Milos Raonic (8) def. Jiri Vesely 7-6(4) 6-4 6-1; Novak Djokovic (2) def. Jeremy Chardy 6-1 6-4 6-2. Women’s singles: Garbine Muguruza def. Serena Williams (1) 6-2, 6-2; Angelique Kerber (8) def. Varvara Lepchenko 6-2, 7-5; Anna Schmiedlova def. Venus Williams (29) 2-6, 6-3, 6-4. Paris: Paul Annacone was smart enough to coach Pete Sampras and Roger Federer to Grand Slam titles, but the player he’s currently working with, Sloane Stephens, rolls her eyes when it comes to Annacone’s cellphone skills. “He doesn’t know what he’s doing,” the 15th-seeded American said after her first-round French Open win Tuesday. First of all, Stephens explained with perhaps a touch of hyperbole, Annacone set up his new phone with oversized lettering, making one word fill the entire screen. “It’s the most ridiculous thing I’ve ever seen in my life,” Stephens said with a smile. Then she got on a roll.